Amerks Win in OT after Late Third Period Comeback · Let's Go Amerks! 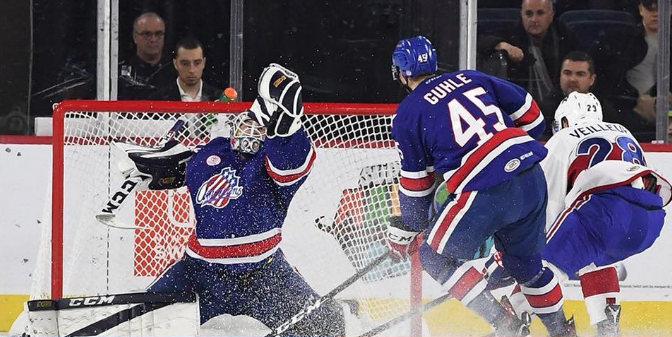 The Amerks found a way to win again with a lot of thanks to their goaltending. They won 3-2 in overtime against Laval Rocket on Friday night in the first of back to back games in Laval. Besides another come from behind win the other big news happened just before game time when the Amerks announced that Steve Moses has been suspended indefinitely. Moving on to the game.. Kyle Criscuolo scored twice, Nick Baptiste scored the game winner in overtime and Linus Ullmark made 34 saves for the teams 18th win of the season. Rochester scored first at 8:57 of the first. CJ Smith was relentless pressuring Tom Parisi of the Rocket in his own end and forced a turnover along the back wall. Spotting a loose Nick Baptiste dropped behind the net, grabbed the puck and put it on the blade of Kyle Criscuolo to score. A goal post was on the Amerks side when Chris Terry tipped a shot that bounced off a post and behind Linus Ullmark. The goal light had gone on but after a review was determined that it never went in. Eric Gelinas scored for Laval at 14:52 of the first period to tie it up. A shot from the point with a lot of traffic in front of Ullmark. The first period ended tied 1-1, both teams had a power play opportunity and the Amerks lead 11-9 in shots. At 5:16 of the second period Chris Terry wasn’t letting the puck stay out of the net this time. As the puck trickled behind Ullmark he beat Stuart Percy to the puck and poked it in for his 15th goal of the season. Laval lead the game through the rest of the second period and most of the third. Linus Ullmark stopped 14 shots by Laval in the third keeping the Amerks in the game. With a pending face off in the Laval end and 1:40 left on the clock the Amerks called a time out, Toby Petersen went to the board and they pulled Ullmark in favor of an extra skater. Kyle Criscuolo won the face off, Seth Griffith passed it back to the point for Matt Tennyson, he passed it to Zach Redmond, he fired a shot and Criscuolo tipped it in to tie the game 2-2! This team doesn’t quit. Goaltending carried them into overtime for the second game road game in a row and again, they didn’t let the goalie down. As thoughts of a shootout started to enter many minds Nick Baptiste decided it was time to call it a night and scored the game winner with 69 seconds left in overtime. Zach Redmond passed the puck to Porter on the blue line, he passed it over to Baptiste who made it look easy skating in and burying the shot from the bottom of the face off circle. Both teams face off again on Saturday night in Laval before Christmas break. Puck drops at 7pm! The Amerks have now won five of their last six games and their second overtime win in three games. This was also the third game in a row the team hasn’t played their best hockey but they’ve found a way to win each game. The Amerks have played 10 games in December winning seven and only one loss in regulation. The other two losses were in shootouts, both against Hartford. Road dominance continues as they’ve only lost one game in regulation on the road this season out of 16 road games so far. Linus Ullmark leads The AHL with 14 wins and minutes played at 1243:41 in 22 games. Zach Redmond is fourth in the league amongst defensemen in scoring with 7G+13A.